Isaiah, inspired by God, assured Eliakim and his friends that God would spare Jerusalem. Rabshakeh and his men had blasphemed God. They would find that He was not to be blasphemed with impunity. The blast in v. 7 turned out to be an angel armed with a mighty sword, who killed 185,00 soldiers in the Assyrian army in one night. 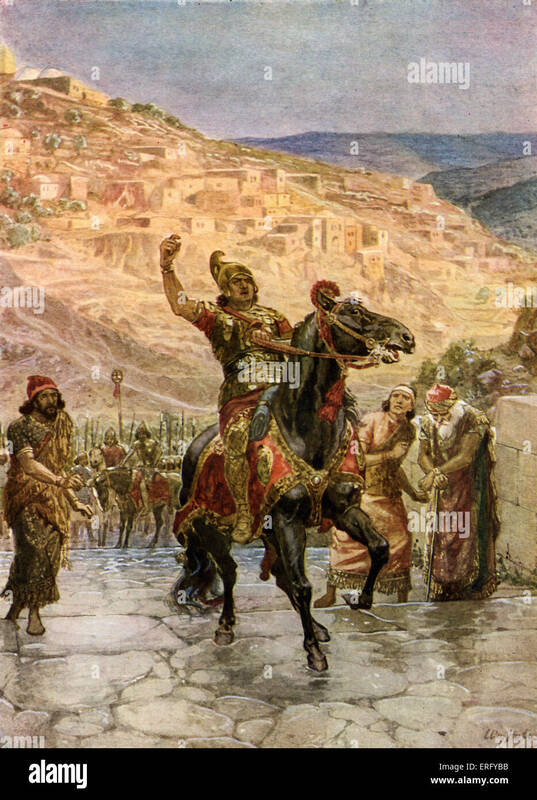 The rumor may have been the news that King Tirhakah of Ethiopia was marching against Assyria, causing Sennacherib to return to Assyria, where he was killed by two of his own sons. We will see all these details working out in the rest of the chapter. I can only imagine the fear that must have consumed the minds and hearts of Hezekiah and the men he sent to Isaiah for counsel. They knew what the Assyrian army was capable of. They understood that their city and their lives were about to be destroyed, and there seemed to be no help for it. They told Isaiah that this day was a day of trouble. Indeed it was. Trouble, rebuke, blasphemy, and weakness. The people were called to account for their idol worship, for their turning away from God, for their lack of character in the face of a challenge from Rabshakeh. The example they used was that of a woman in hard labor who did not have the strength to push the child out of her womb. She was helpless. Hezekiah’s message to Isaiah was, “It may be that the Lord thy God.. …will hear your prayer and deliver us.” It wouldn’t seem that Hezekiah’s faith was very strong, and that he recognized his own weak relationship with God. He seemed to know that Isaiah had God’s ear, and he was asking Isaiah to intercede for Jerusalem with God, hoping that God would heed the prayer of Isaiah. Apparently there was still a remnant–a few people in Jerusalem–who trusted God. Hezekiah asked Isaiah to pray that God would deliver Jerusalem for the sake of the remnant there who still obeyed God. Isaiah 37: 1-2. “And it came to pass, when King Hezekiah heard it, that he rent his clothes, and covered himself with sackcloth, and went into the house of the Lord. And he sent Eliakim, who was over the household, and Shebna the scribe, and the elders of the priests covered with sackcloth, unto Isaiah the prophet the son of Amoz. After Hezekiah understood the full import of Rabshakeh’s threats and decrees, he was filled with sorrow and probably a lot of fear. He tore his clothing, as was the custom in times of distress, and replaced it with rough, humble burlap. Then he went into the house of God to pray. The first Person he turned to was God. That is as it should be. So often, we go there when all else has failed. The second person he turned to was Isaiah the prophet, the son of Amoz. Another wise choice. Sunday Morning Coffee: Back to Church! It’s Saturday night, almost 8:30. I’m writing tonight, as I sometimes do, to save some time in the morning. I think I’m actually going to go to church tomorrow! I’ve missed four Sundays, which for me is just unheard of. It makes me sad that this sort of thing has happened all too frequently in the past couple of years. I hope this is the end of it for a while. I hate being sick, hate missing out on my normal activities. I miss the fellowship, the teaching, the preaching of God’s Word. So I’m really looking forward to tomorrow, It’s good to feel good again. I may be jumping the gun, but I’m hoping that we don’t get any more deep-freeze temperatures this winter. It’s hovering in the 40’s right now, and that’s completely bearable for the end of February. I’m looking SO forward to spring. I was noticing, on my way home from work the other day, that the grass in all the yards in my neighborhood is a yellow-brown color. It feels like things are just kind of waiting. . . .anticipating. . . .gathering as much sunshine as possible as green season approaches. One of the things I enjoy about winter is that spring is sure to follow. Aren’t you thankful for the wonderful world God has created for us? I Timothy 6:17 tells us that God has given us all things richly to enjoy. Even winter. There is beauty in winter if you see it through God’s eyes. Snow is amazing stuff, creating a fairytale landscape that sparkles like diamonds. And it is in winter that the earth can hibernate, at least in the northern climes. Sort of like I had to do for most of this month–rest, restore, replenish. I have seen many, many posts about Billy Graham. I’m old enough to have vague memories of when he got started. There is no doubt about his impact for Christ, and he was indeed a vital, inspiring preacher of the gospel. He was one of the greats of the last century, and this century as well. And so, by the way, was his wife. I have also read that people have heard or read that now that Billy is gone, the power of the gospel will disappear from America. Dr. Graham would be the first to stand against such an encomium. It is true that his influence was world-wide, and many thousands of souls are and will be in heaven because of his work. But the Holy Spirit of God is not removed from America or any other place in the world because of the death of one man, no matter how much of a giant of God he may have been. I’m thinking of the thousands of humble pastors laboring in churches large and small across America. Many of them are underpaid and overworked. Many will live their lives, serving God and their congregations, with no fanfare or recognition. Their wives will labor quietly beside them, and never achieve national prominence. Billy Graham may have been America’s pastor. That was the call God placed on his life and in his heart. It is no less a calling to be the unknown, faithful pastor of a church no one will remember 50 years from now. The work needs to be done. God calls men and women to do it. And He gifts them according to their calling. When Christ comes to take all believers out of this world, THEN the Holy Spirit will be removed from this nation and all the nations of the world. In the meantime, let’s not forget to honor our pastors and other ministers of God in our local churches. Eliakim, Shebna, and Joah obeyed Hezekiah’s order. They were not to answer Rabshakeh. They remained silent, but they were in such inner turmoil that they did something typical of their time. They tore their clothing in their grief and dismay, and reported back to Hezekiah in that condition. I’ve never been tempted to tear my clothing when I get bad news, but to do so was customary back then. It was an expression of grief, of sorrow, and perhaps of a sense of helplessness. These three men knew exactly what their city faced at the hands of Assyria, and there had been no chance of coming to any sort of truce with Rabshakeh. I can imagine the heaviness of their hearts as they made their way back to the palace to see Hezekiah and tell him their news. Rabshakeh ignored Eliakim and made a direct appeal to the people watching from the walls. He told them not to trust their own king, Hezekiah, who was powerless to deliver them. He told them not to trust in the Lord God of Israel, because He hadn’t saved anyone from the assault of the king of Assyria. 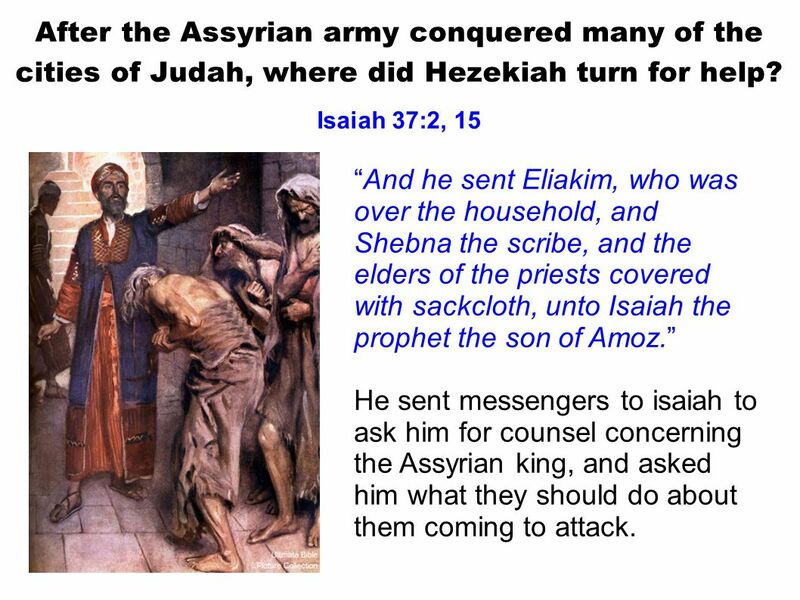 He told them that if they gave gifts to the king of Assyria, they could all stay in their own land until the king of Assyria took them to another land just like their own, where they would be happy and content. He told them that none of the gods of other nations had protected them from Assyria. It was quite a speech. Reminds me of some of the deceitful campaign speeches we hear in every election cycle–promises of milk and honey, of comfort and peace. We are foolish to be deceived by such rhetoric, and the Jews who were impressed by Rabshakeh were just as foolish. If it had existed at that time, I’m sure someone would have wanted to give Rabshakeh and the great king of Assyria the Nobel Peace Prize.